The Ministry of Education and Training has launched a competition “Youth learn and follow Uncle Ho’s ideologies and ethics” in 2018. The competition is informed to all students in and outside the country and becomes one of political activities in the education sector. The content includes uncle Ho’s teachings to youth, lessons of Uncle Ho’s ethic and style, the late president’s will. Additionally, youth should study Uncle Ho’s ideologies on the islands, basic content of work standards of morality. They also learn more about achievements in building and protecting the country under the Party’s leaderships especially in 32 year renovation and giant policies in the 12th Party Congress’s document. Sixty participants with highest scores will enter the final round. There will be two categories. The A category is for high school students and the B category for students, managers in school, lecturers aged under 35 and Vietnamese students studying abroad. Students should register an account via the website http://hocvalamtheobac.vn from March 15. Account will be verified via personal email. Each people is eligible for one account only. 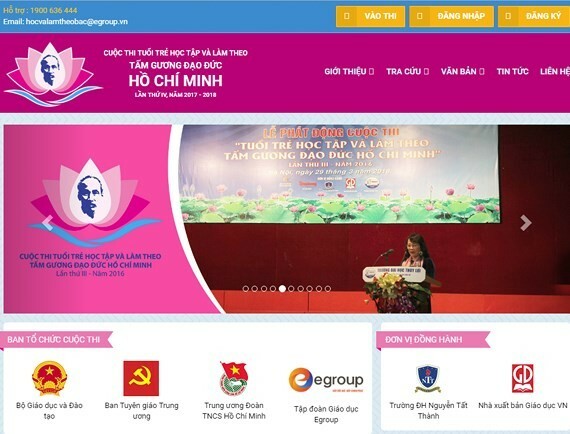 The first and second winners will receive certificates of merit signed by the Education & Training Minister and cash while the Ho Chi Minh Youth Communist Union will give certificates of merit and cash to third prize and the encouragement prize. The awards ceremony is scheduled to take place in June in Ho Chi Minh City.